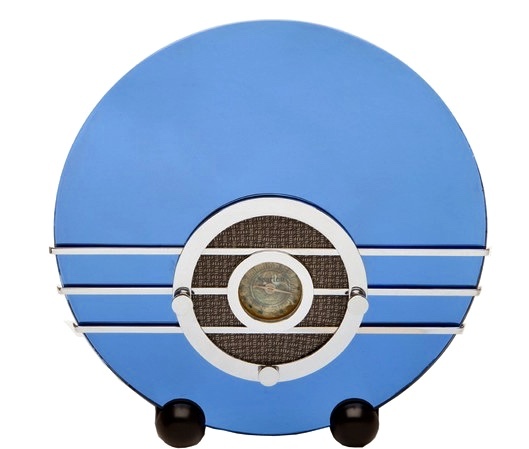 One of the most unique & beautiful radios is the Sparton Bluebird. 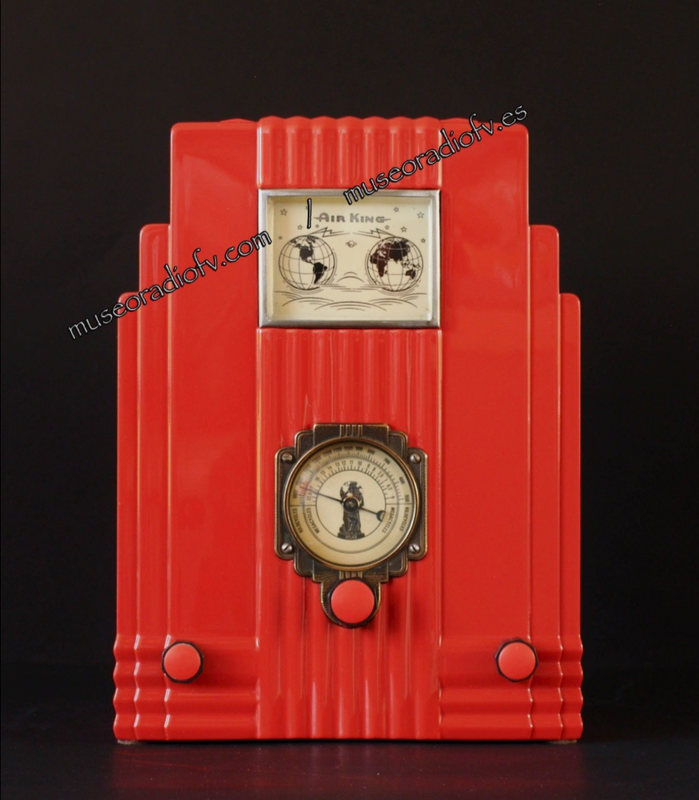 It was designed in the 1930’s Deco age. Bluebirds normally sell for about $2,500 to $5,000 depending on the condition. In the late 1990’s, the Thomas & Crosley companies sold reproductions of the Sparton Bluebird (obviously manufactured by the same company). The major difference was they used 16-inch mirrors, instead of the approximately 14-inch mirrors used on the original. They also used chrome feet instead of black, and the dial was not exactly like the original Bluebird, among many other variances. However, the beauty of the design was all there. 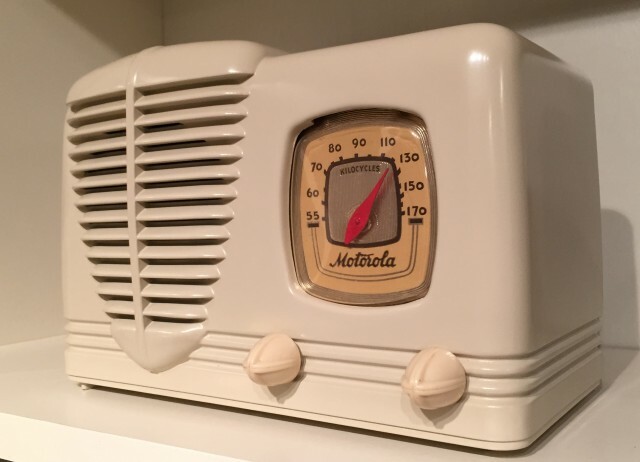 In fact, despite the differences between the real & reproduction, the reproduction radio is as beautiful to view as the original. 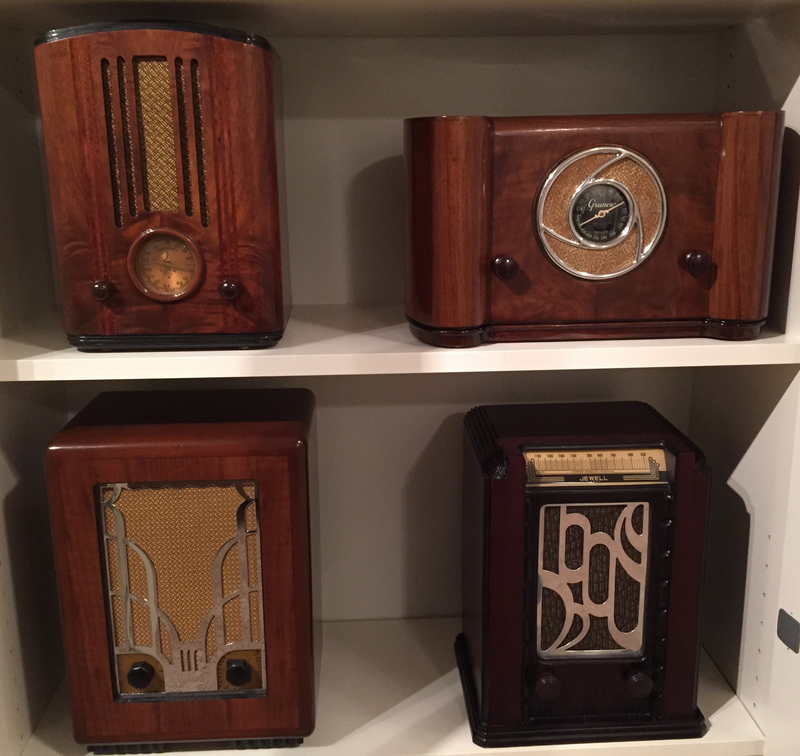 Those reproductions are now hard to find…collectors don’t want to part with them. In April 2016, one sold on eBay for nearly $500. Not bad for a reproduction. 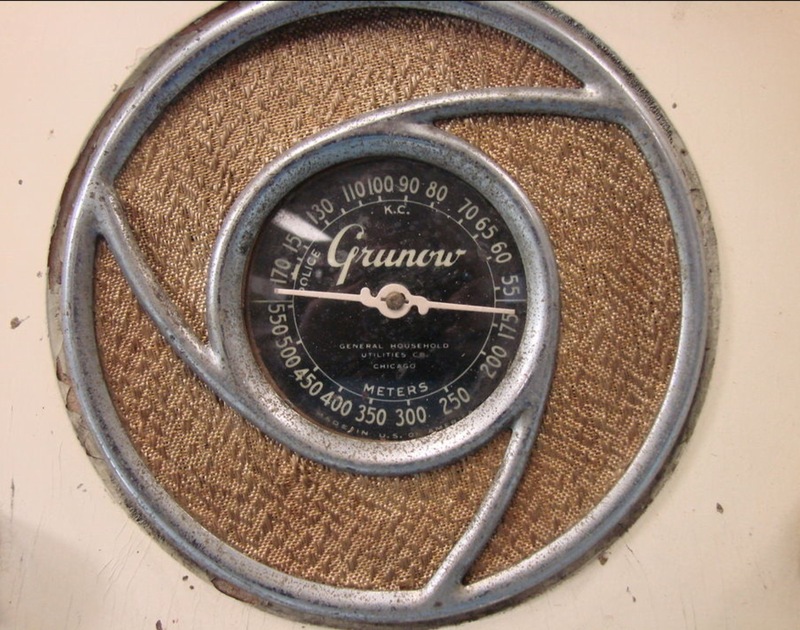 Later, Crosley made a 14-inch version, but unfortunately it appears they kept the large chrome circle the same size, which made it too big proportionally, and then added their name boldly on the large circle as well. They also made a mini 8-inch version. Neither of those versions is very collectible, although they’re still nicely reminiscent of the original design. The real thing is always best, but the beauty of the original design can be found in a well-made reproduction. 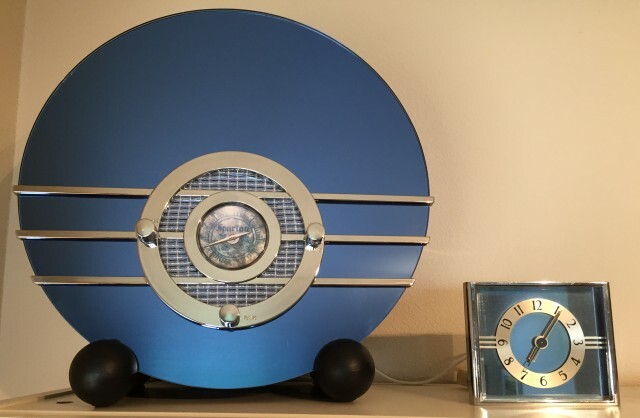 The blue mirror on the original Sparton is like the case of a Catalin radio. 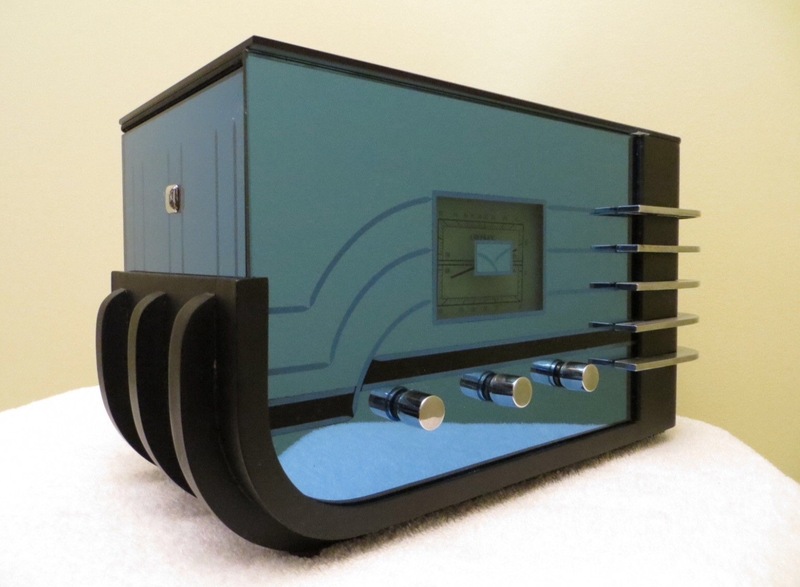 The wooden box that holds the chassis is simply utilitarian, and is normally hidden by the mirror. So, if the original 1930’s mirror breaks and is replaced by a new mirror, doesn’t that make it a reproduction? 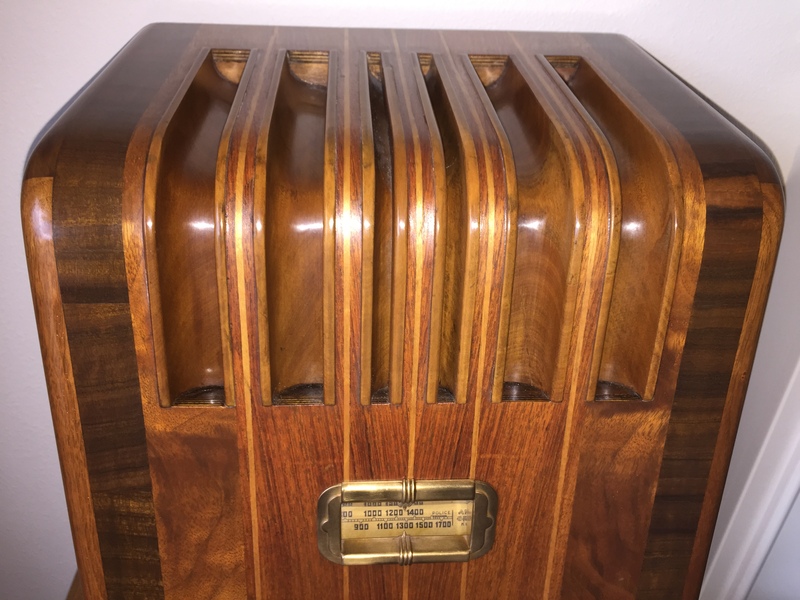 Certainly, if a Catalin case is replaced by something newer, the radio would not be considered original, even if the other parts were all original. 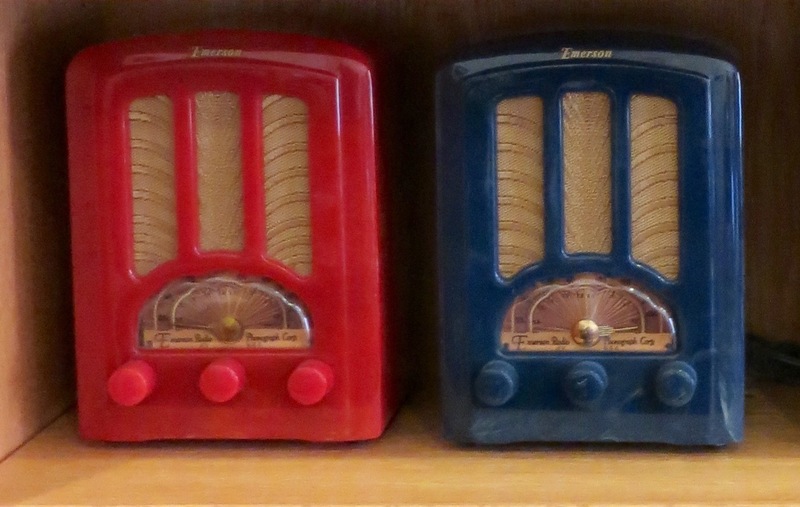 Here are two 1937 Emerson Tombstones. Only they’re not. They’re actually full size reproductions made by expert parts provider Kris Gimmy several years ago. A Washington collector I know owns these two radios, and is very happy to have them mixed in with his original and expensive Catalin radios. 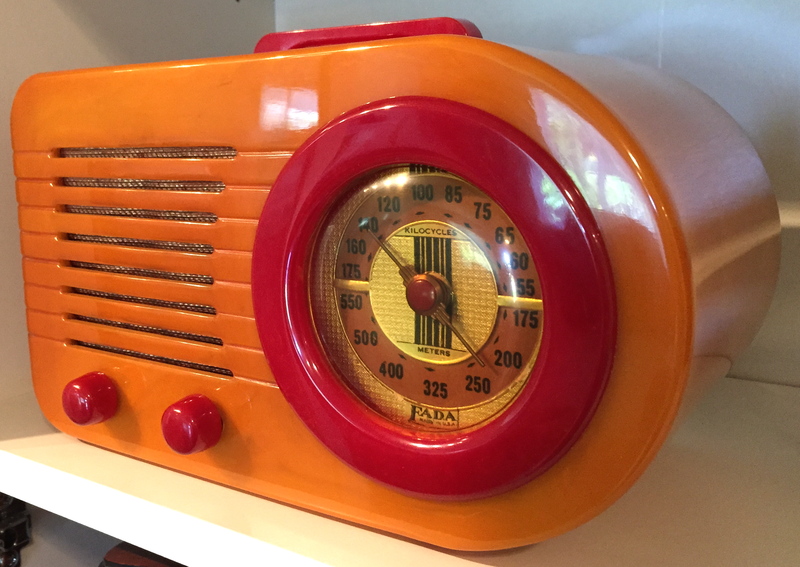 Update: Below is a radio that was made to look like a red Air King. The chassis is original, but the red case is painted instead of colored Plaskon. It sold for nearly $5,000! 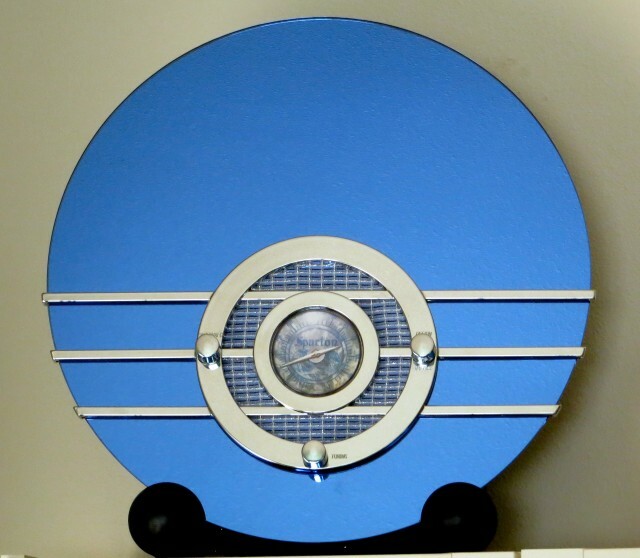 Update 2: The below Crosley reproduction of a Sparton “Sled” went for nearly $800 in April, 2016. 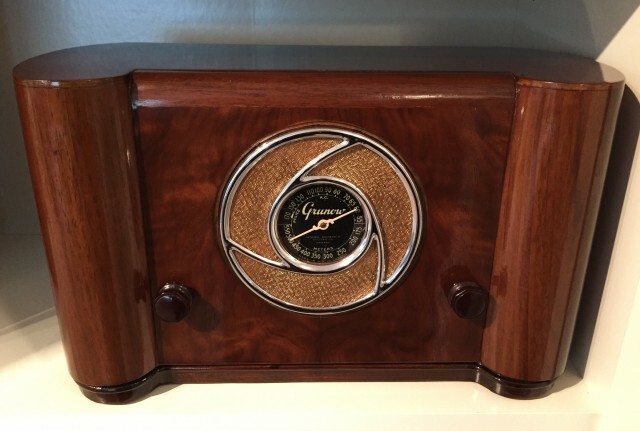 It’s a radio collectors dream…to find a rare & valuable radio at a garage sale. 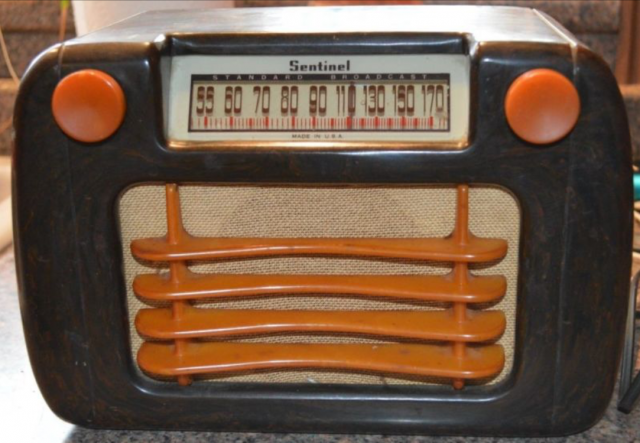 It’s listed as a Catalin Sentinel 248-NR, and described as “brown”…no cracks or breaks. 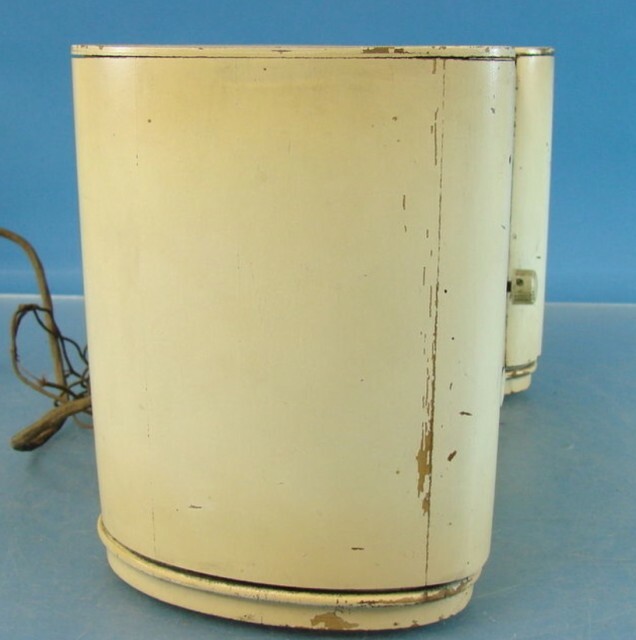 The seller doesn’t know the key thing. Under that discolored surface…it’s really blue. 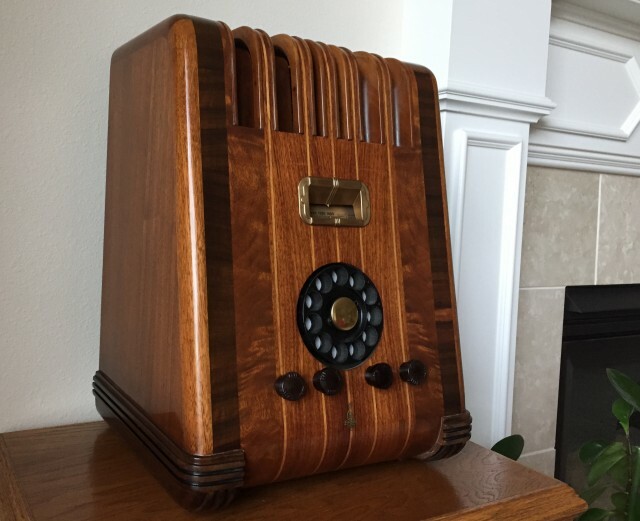 The lucky find was made by a person who doesn’t know or collect radios. It wouldn’t be right for someone to try to steal it by offering the seller an unfair amount. 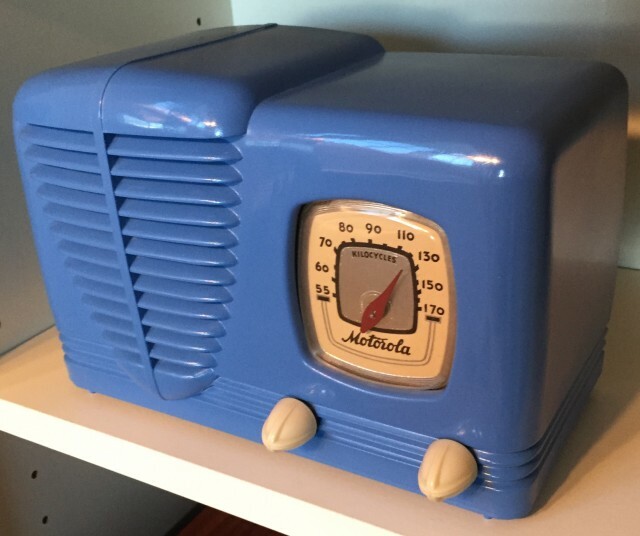 So I quickly sent an email to the seller letting them know they had a very valuable radio, that it’s blue, and that one like it sold for a huge sum at an auction in 2007. With both sides now having the necessary information, there could be a fair negotiation. 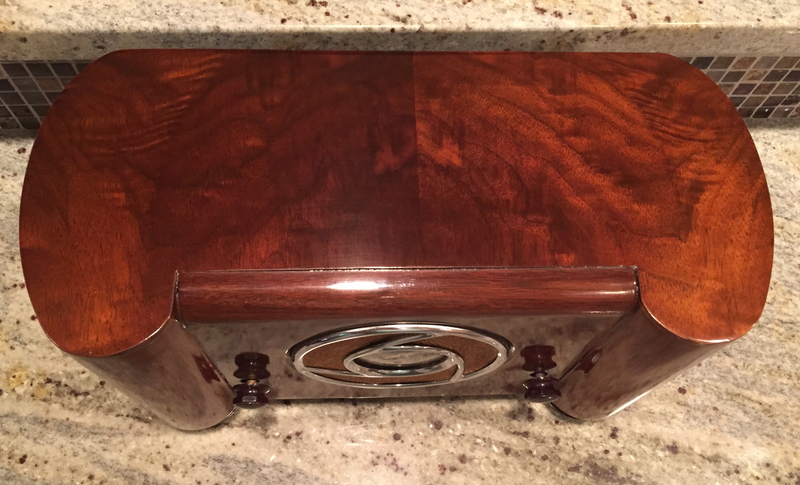 I found out the seller was a very nice woman named Lori. She said: “I was in the garage of a hoarder house on the south side of Chicago”. 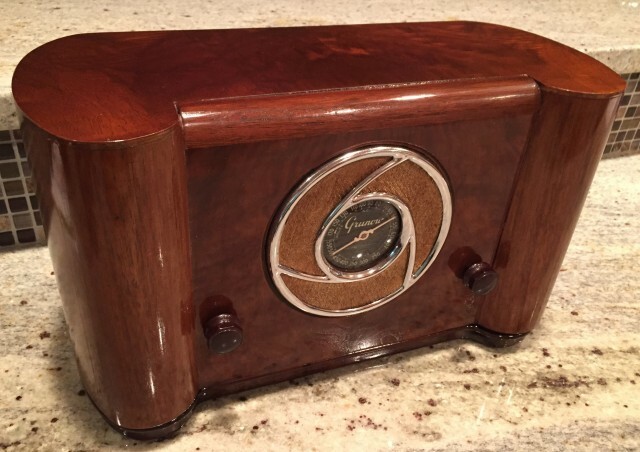 “It was sitting on a shelf, and I thought it looked cool, so I offered them $75”. Soon she was getting lots of emails with offers, she also got a laugh when I mentioned the grille was upside down. 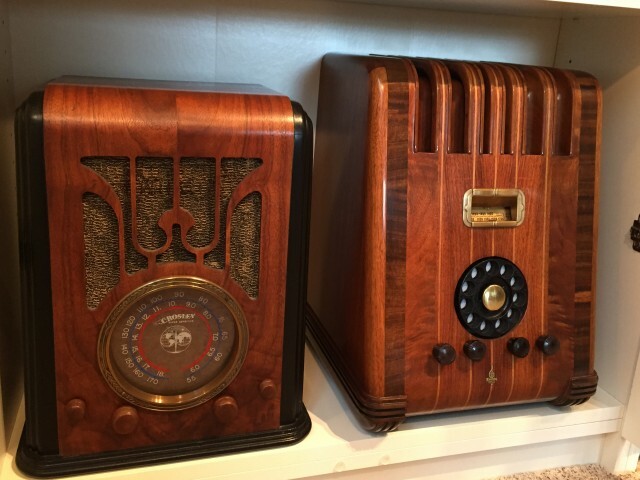 Eventually, Lori settled on a very solid offer of $12,000…not as high as the $30,000 paid at that 2007 auction, but it certainly was a dream for her to have a garage sale item be a true treasure. Now we need to see the Sentinel when it’s taken back to it’s beautiful swirled blue. Update: Found out the Sentinel was purchased by friend & collector Ron Stoner of South Carolina. Ron taught me a lot about radios when we both lived in Lincoln, Nebraska. 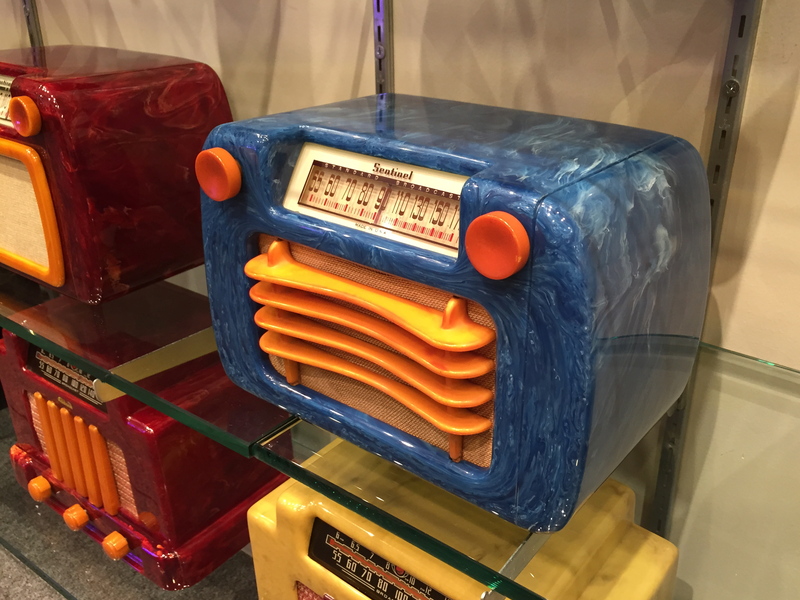 He says he plans to only lightly clean the radio, rather than taking it back to it’s bright blue color, because some collectors prefer their radios untouched…and of course…someday he’ll be selling it. The owner is Hugh Hunt. 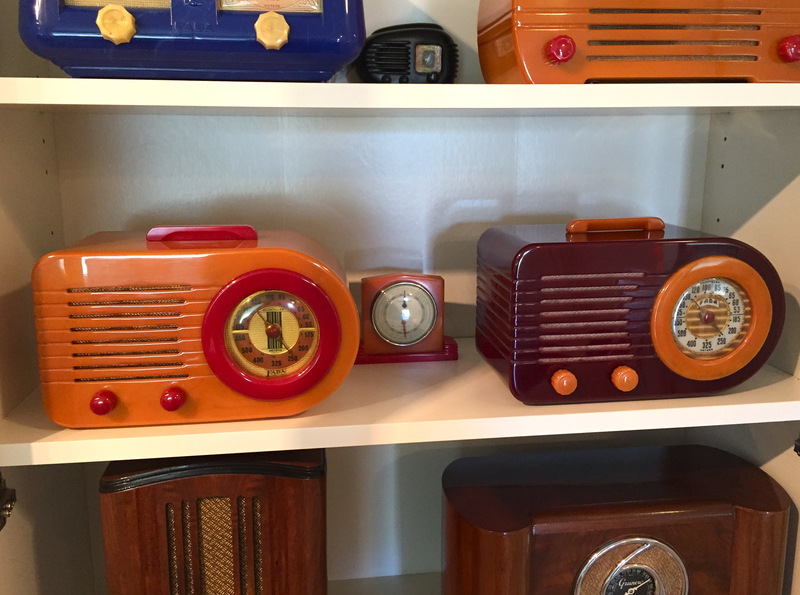 Hugh & his wife Jane have what looks to be the best Catalin collection in the world. 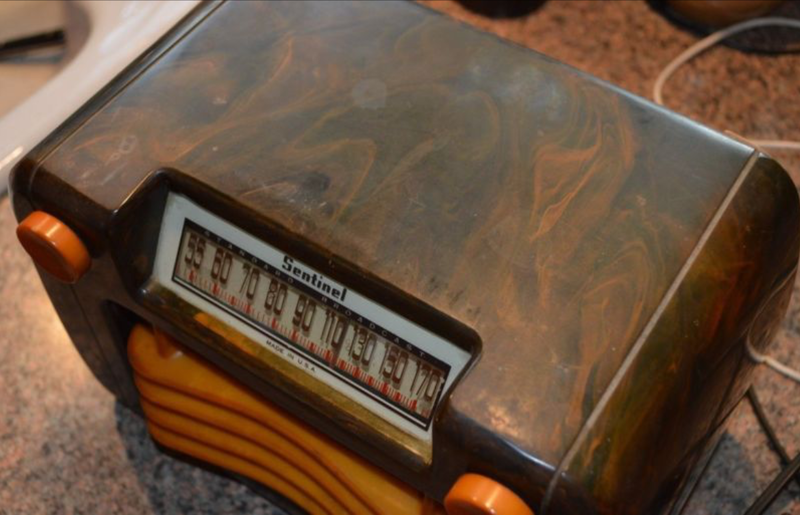 Plus, they have many other rare non-Catalin radios. You can see their radios at www.goldenhue.net. Thank you to Lori, Ron & Hugh for letting me tell their story. So glad we get to see the radio case in all it’s original blue glory! So, for now, the Emerson sits on a stand near the fireplace, but it will probably end up somewhere else. There are some unique features with this particular model of the “Slant-Front”. 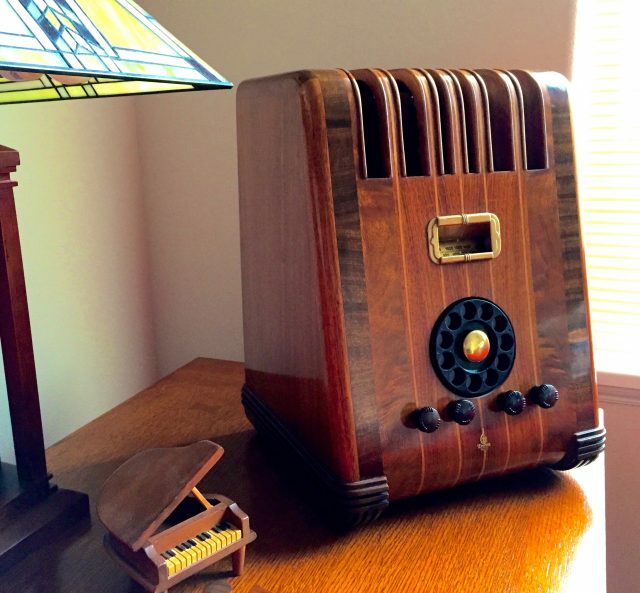 Obviously, the tele-dial stands out. It can be turned by hand to tune-in stations, or one can use the regular tuning knob. 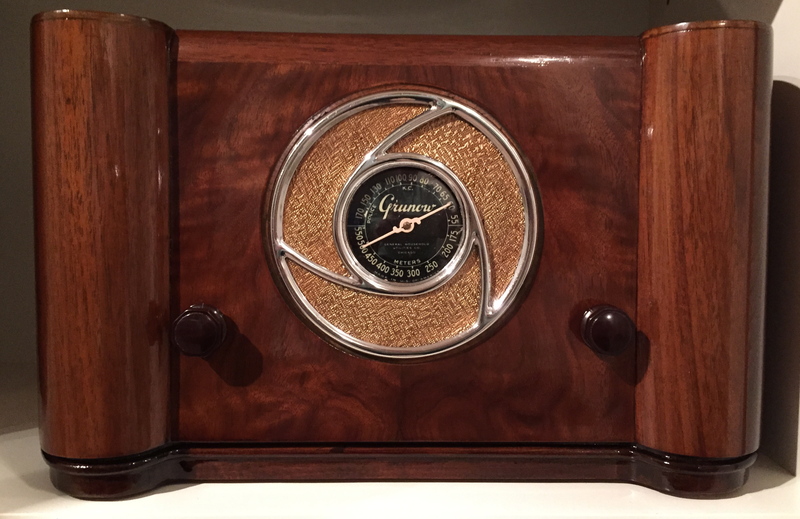 Another knob flips the dial from the AM display, to the Short Wave display. 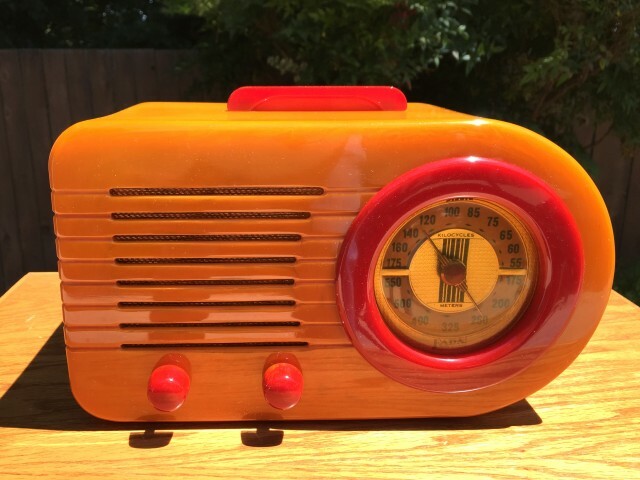 Also, the dial moves back-and-forth left-to-right to display the frequencies, instead of the usual pointer moving across the dial. 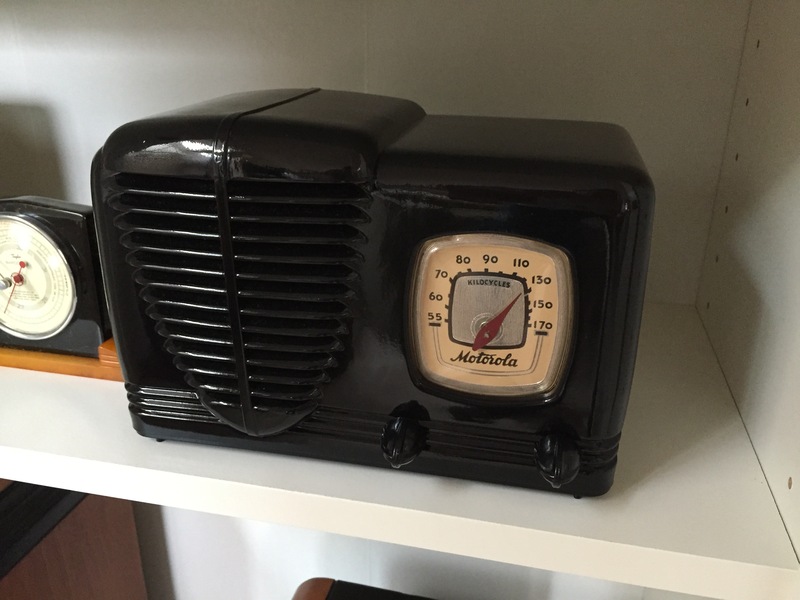 I sure like the radio…now…where to put it? 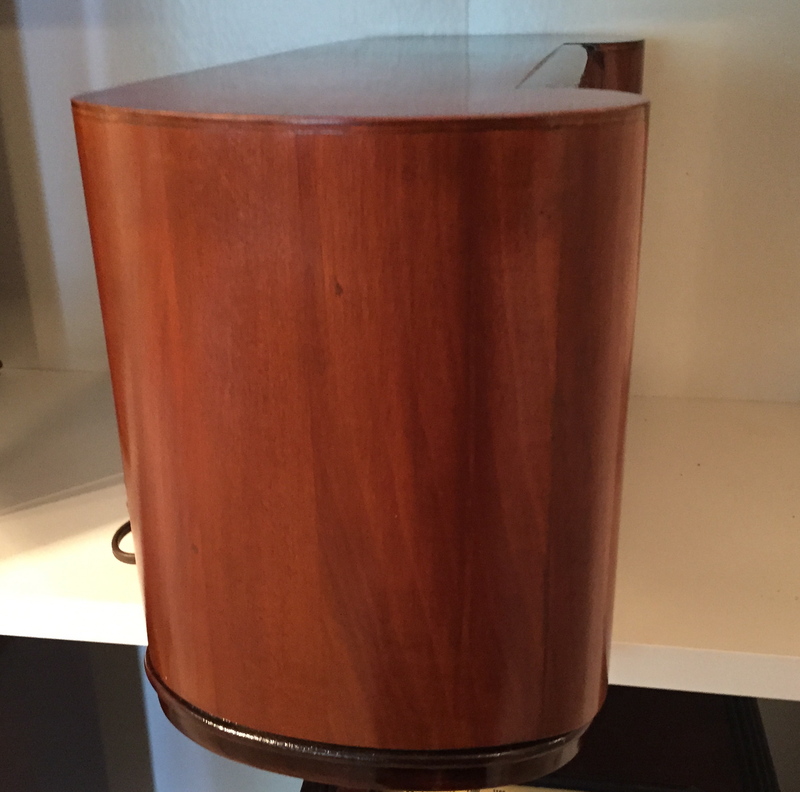 Maybe an end table. 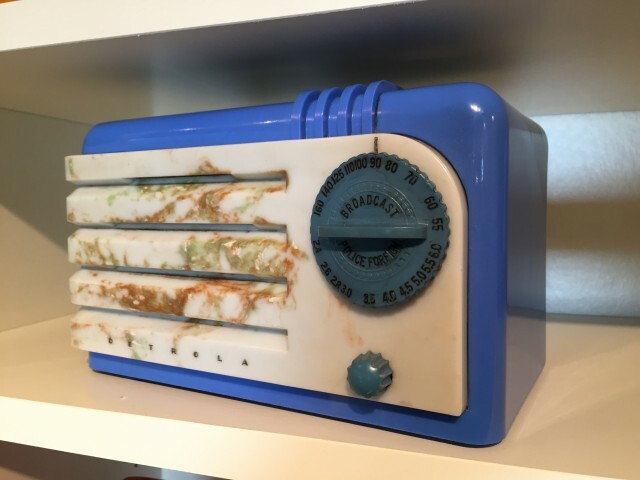 Why is this radio blue? 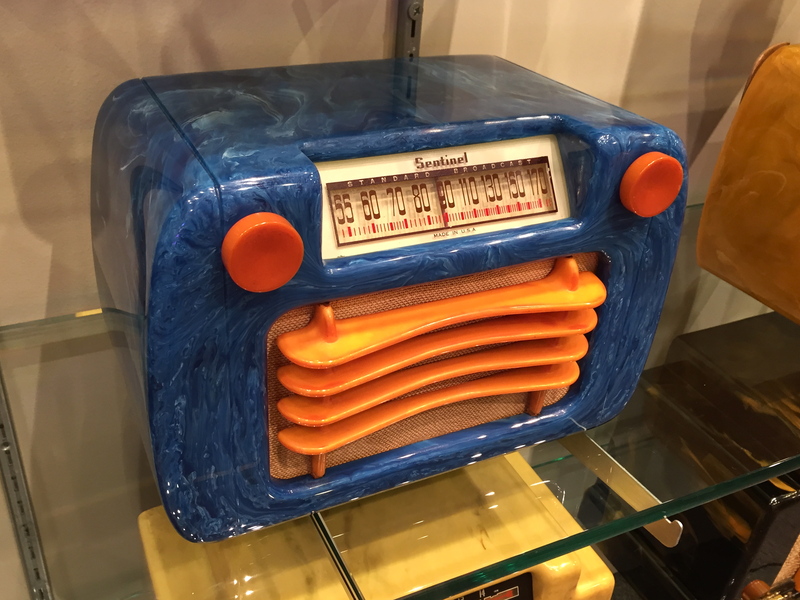 I didn’t have any repainted radios in the collection, but this one was well done… and since I might not find another one…I bought it. I already had an ivory one, and black was a fairly common color for 1939 radios. Unfortunately, the paint job wasn’t as good as I’d hoped, and some of the cracks still showed. So…I stripped the paint off and started over. After more filling and much more sanding, I made a bold choice (some might say wrong choice). I painted it to look like the blue Plaskon radios of the late ’30’s. 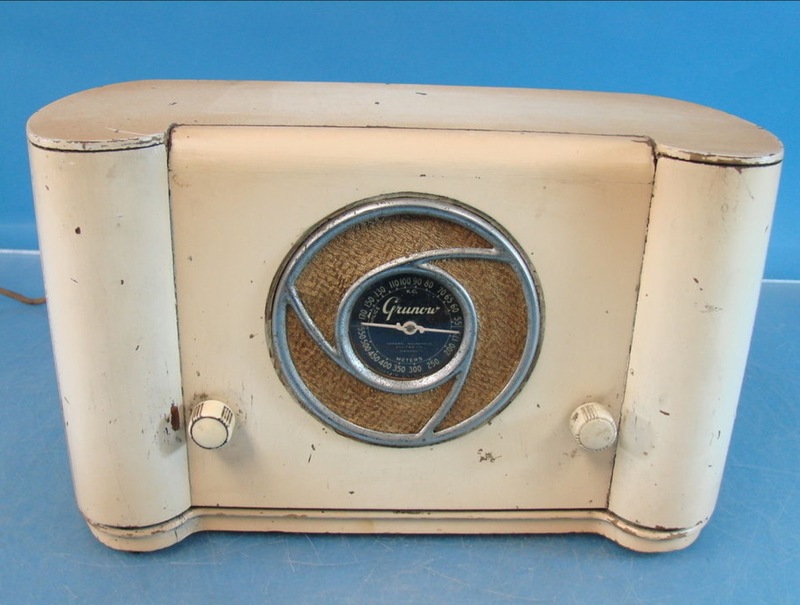 The radio’s design features show up better with the lighter color, and I didn’t want another ivory one. It’s probably a poor choice if I were planning to sell the radio, but I wanted to enjoy it for the design. One bonus is that the chassis was working great. 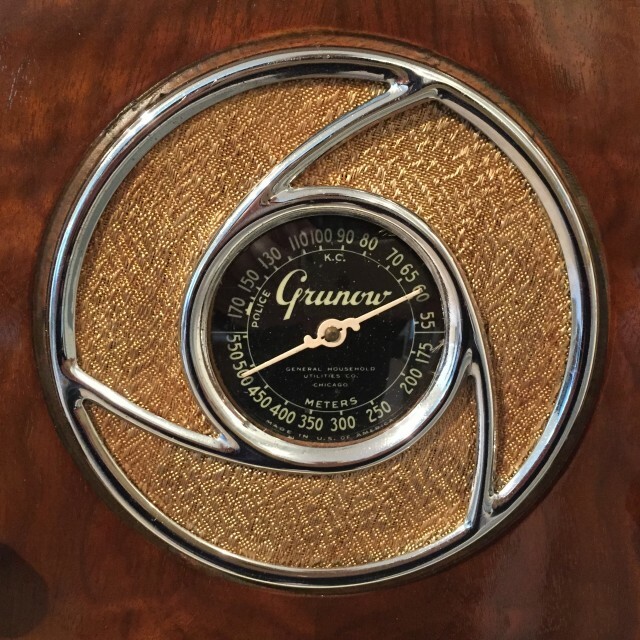 The speaker grille reminded me of an old microphone, but my research found that mics that look like that actually came after 1939, so it probably was designed to look similar to some of the car grilles of the ’30’s. By the way, the dictionary defines “grille” as the covering of an opening…such as a car grille. And it defines “grill” as a place to eat, even though some Bar & Grills add an “e” because they think it looks fancier. 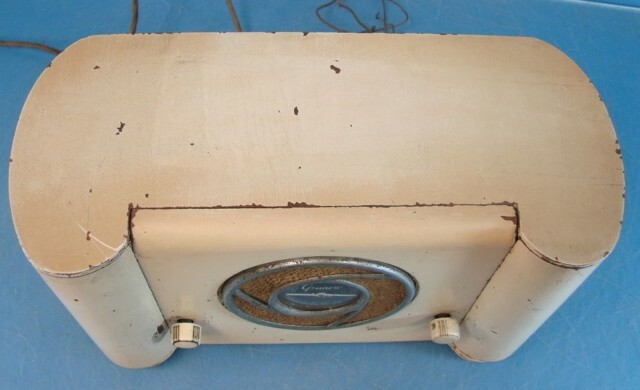 So the proper spelling of the speaker covering on a radio is apparently “grille”.